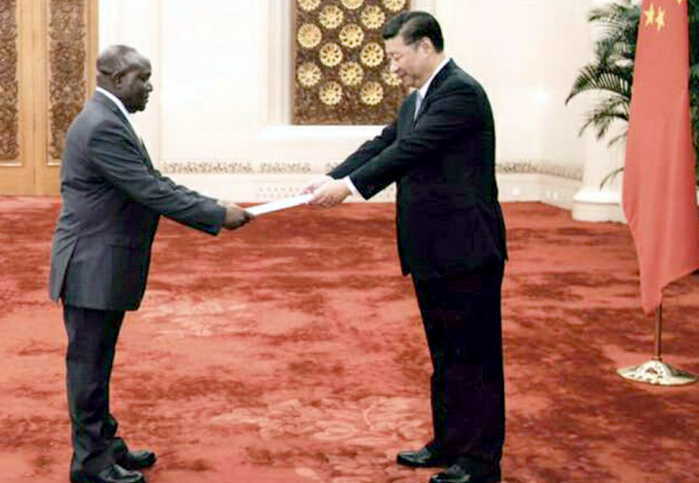 Chrispus Kiyonga, Uganda’s Ambassador to China, the world’s second biggest economy, presented his credentials to President Xi Jinping last week, a statement from the ministry of foreign affairs has revealed. During the ceremony that took place at the Great Hall of the People in Beijing, President Xi Jinping welcomed Amb. Kiyonga to China and conveyed sincere greetings to President Yoweri Museveni. The statement indicates that Kiyonga was designated as an Ambassador Extraordinary and Plenipotentiary of the Republic of Uganda to the People’s Republic of China. According to an expert in the ministry of foreign affairs, the special title indicates that the Ambassador holding that docket represents a country’s interests beyond the borders of that country where he is based. For example, Kiyonga is Uganda’s Ambassador in China, but also responsible for Taiwan. Other Ambassadors Extraordinary and Plenipotentiary include Uganda’s Envoy in Addis Ababa who is also Uganda’s Ambassador at the African Union. President Xi stressed that the relationship between the two countries has grown from strength to strength and will continue to make further progress with the contribution of Amb. Kiyonga. President Xi Jinping observed that the appointment of Amb. Kiyonga who is a senior and experienced person demonstrated the importance President Museveni and the Government of Uganda attach to the relationship with China. The President pledged that his Government would give Amb. Kiyonga every help to ensure success of his mission. Amb. Kiyonga conveyed warm greetings from H.E. President Yoweri Museveni. He spoke positively of the bilateral relations, adding that Uganda had benefited from the partnership with China. 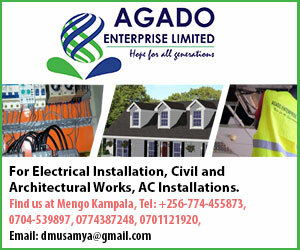 Kiyonga indicated that the infrastructure of Uganda was modernizing quite fast with financial assistance from China. Amb. Kiyonga expressed the desire of Uganda to advance the relationship between the two countries to a strategic level as well as linking FOCAC (Forum for China Africa Cooperation) plans to the national development plans and vision 2040 of Uganda. President Xi Jinping welcomed efforts that build on existing China-Africa cooperation to deliver more benefits and boost bilateral ties. Amb. Kiyonga arrived in Beijing, China on 20th August 2017 to assume his duties as Head of Mission. He was accompanied at the ceremony by his spouse, Alice Kiyonga. Other Uganda Embassy officials at the ceremony included Nelson Kasigaire, the First Secretary and Laura Kahuga, the Third Secretary at the Embassy of Uganda.